Depression is a clinical illness that is far more than just an extreme feeling of sadness. Sadness affects everyone, and it is normal and healthy to react to sad events with an emotional response. However, with clinical depression, the feelings of sadness and hopelessness go far beyond what would normally be experienced. Clinical depression could arise from chronic stressors, a specific event, or even have no obvious cause at all. There are many different types of depression, one of which is seasonal affective disorder (SAD). People with this disorder will often notice a seasonal pattern with regard to their depression, with most experiencing increased levels of sadness in winter. What causes winter-induced SAD is not yet fully understood, but it is thought to be linked to reduced exposure to sunlight. Sunlight can affect some of the hormones and chemicals in the brain, but the exact effect of sunlight on mood is not yet known. The production of melatonin and serotonin is thought to be affected by exposure to light, so people with SAD might need more sunlight than others. 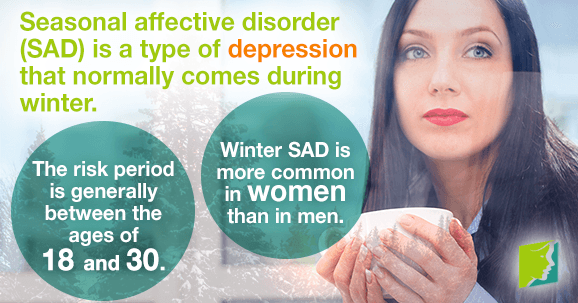 As with all types of depression, winter SAD is more common in women than in men, and it is also more likely to affect young women. The risk period is generally between the ages of 18 and 30, but it can also affect individuals older or younger than this. Around 12 million people in Northern Europe suffer from SAD. What Are the Consequences of SAD? Lifestyle choices can exacerbate the symptoms of SAD, and even bring it on altogether. Making a few changes to habits can make a huge difference to a sufferer and, in some people, can even eliminate the condition altogether. Resist the urge to eat too many highly processed foods and instead opt for foods that are rich in vitamins and minerals. Also, eating fiber-rich foods will increase your energy in the long-term, and you will not suffer the energy slump that is common after eating foods high in sugar. Although a sedentary lifestyle can go hand-in-hand with winter, it may not be helpful for someone who suffers with SAD. The recommended amount of exercise is 30 minutes a day. This can be done in a gym, at an exercise class, or even by throwing snowballs with the family. Feelings of isolation will only worsen SAD. It is important to spend as much time as possible in social situations. Accept invitations, join a Christmas craft class, or invite a few friends round for dinner - these can make a world of difference to your mood. Winter SAD can ruin the holiday season for many people, and the lack of light, increased unhealthy food intake, and lack of desire to exercise in the cold weather can all be contributing factors. Following the above advice can help, but it is important to seek medical advice and complement these lifestyle changes with certain medical therapies, if they are right for you. Getting regular exercise, maintaining a healthy diet, and keeping a solid support system are all beneficial in overcoming depression. Anxiety and depression can become serious medical conditions and they widely impact women, including during menopause. Q&A: How Does Chocolate Benefit Women Suffering From Depression? It's rich, sweet, and in moderation can be good for your health. Chocolate has a solid reputation for being a mood-lifter. Learn more here.